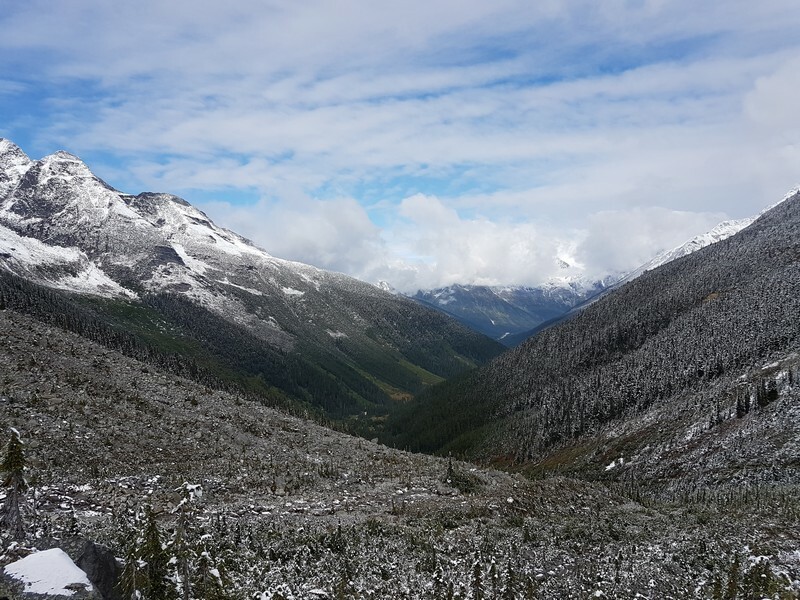 Road trip through British Columbia and Alberta. In 2017 Canada celebrated its 150 year existence with a free park pass. The combination of a free park pass with the fact that Canada stood high on our todo list, made us going to Canada in the autumn of 2017. On Saturday 16th of September we got up and started our journey towards Schiphol, where used a budget parking of Q-Park, located next to Spaarne Gasthuis. Parking 3 weeks only took us 55 euro and it included free shuttle towards the airport. The bus arrives every few minutes and takes about 15 minutes to get to Shiphol. We took off in Amsterdam with a non-stop KLM flight towards Vancouver International Airport. That was good for 10.5 hours of fun, luckily we had each our own multimedia console and after 4 movies, 3 times food we were ready to hit the customs of Canada. Once we arrived in Vancouver, we picked up our rental car. This time we picked Hertz as we got a 5% reduction through Tom his employer. It was the cheapest deal we could find. It took us 570 euro for 3 weeks drive with unlimited amount of kilometers. We got a C-Class Toyota Corolla. We could easily fit our bags on the backseat and the trunk we used for our tent, food, shoes and the stuff we needed most. After some serious shopping, we were heading towards Mission, with Judy & Ken, an AirBnb spot we booked earlier in 2017. We can only encourage the AirBnb principle as this allows you to meet real local people, which is often questionable when hitting yet another hotel. The next day we hit the road after a great breakfast served by Judy and our first real stop were the Othello Tunnels in Hope. This is just a small detour from Highway 3. It are 5 tunnels in the rocks which are quite impressive. Just try to imagine that the train still passes here.. It’s quite impressive to see how they must have achieved this many many years ago. Once we went from the parking lot through the tunnels, we decided to continue our walk. The further we went, the less people we saw. At some point we saw a sign for a marked walk, which we started to follow. It was first quite steep, but manageable and after approximately 6 km we arrived back at the parking lot. 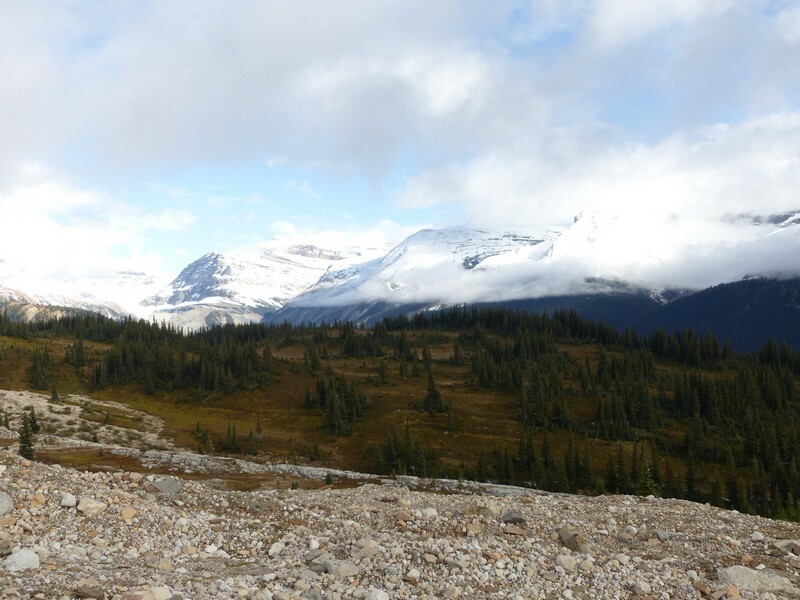 We continued to EC Manning Park, our first Canadian Park and first time we would spend the night in our tent. The setup went quite well and right after we decided to walk around the lake. This was 9.5 km and took us about 1.5 hours. It’s an easy flat trail. You have some nice views on the lake. Lightning Lake campground: our site for our tent and car was big enough and we found one relatively close to the sanitary block. The shower was free and you could use it as long as you want, but the sanitary block was not heated, which was less convenient to undress and hit the shower. Further there was no shelter and the price was quite high for staying without electricity. Not the best camping we had. In the morning it was -1°C and it was horrible to clean up our tent after the first night. Will this be the story of our travel? Luckily our Toyota had seat heating and after 5 minutes we were all warmed up. While leaving the park we saw some trails and decided to take a walk. First we went towards Windy Joe Mountain, which started gently became steeper when the hill started. After some kilometers we decided to turn back as it was no loop. We don’t like too much the return walks. Back at our car we saw the Canyon Nature Trail, a 50 minute loop, which we added to our hiking. It’s an easy walk which is not too impressive. Ready to move to the Okanagan wine valley. The closer we got, the better the weather. Just before you reach Kelowna, you have the spotted lake on the right side of the road. You can’t access it currently as they are restoring the nature, but it’s still worth the stop to see this strange phenomena. Once we reached the village, we had a nice 22°C. On arriving in the city we went to the tourist office to get some insights on camping grounds and hiking possibilities in the area. The hostess pointed us to the campgrounds at the lake side. Further she told us about the irrigation and winery trail. Once installed we decided to make that walk, but the hostess clearly has not done it herself, as the walk is rather disappointing. You indeed see some wineries, but for the rest it’s walking on a asphalt small road around the Osoyoos Airport. It was around 5 km and took us 1 hour. We would not recommend spending time on this walk. While being in a the Okanagan Valley we decided to visit a winery, our choise was the Adega on 45th. This was not much of a deal. It looked very nice, there was a tasting room where you could taste their wines and then buy something. But there’s not much around to spend a lot of time. We bought a bottle of (expensive) wine and left after about 15 minutes. Later on we found the wine cheaper priced in a liquor shop. Tamri Motel and Campground: It was cheap and it was quite OK. The host was very friendly and there was only 1 other lady staying on the campground. We got a heated bathroom and warm shower. Awesome. For this price, you can’t find a better deal around. 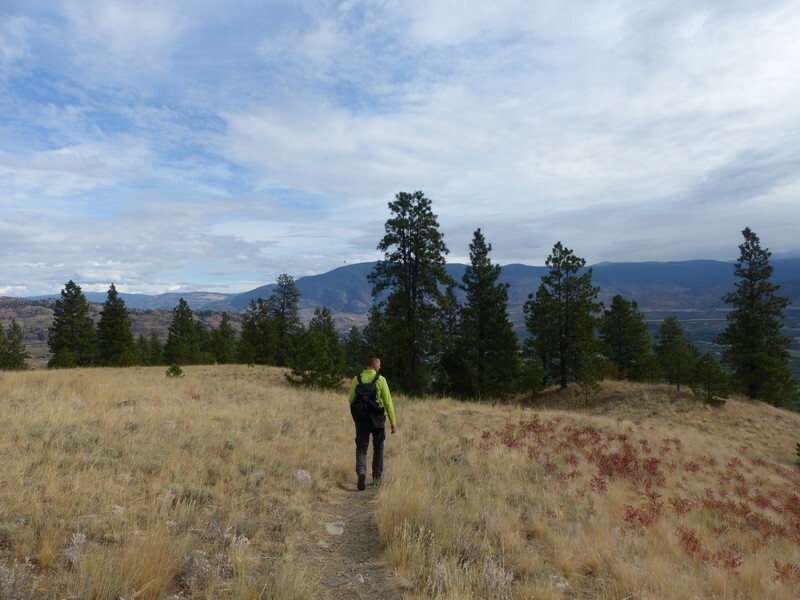 We left the camping behind us and continued in the Okanagan Valley, seeing one after the other winery. After our adventure of yesterday we decided to not stop anymore. We went straight for the golden mile trail. This trail starts on Tinhorn Creek Road, an exit from route 97. The walk starts on the parking lot of the winery. You take off between the vineyard and after few minutes you start with a climb. On this hike you can also see the ruins of the Stamp Mill. The golden mile trail is a return hike which we not completed. We turned back earlier because we didn’t want to spend too much time. In the end we had 8.5 km and it took us just below 2 hours. You have some nice views during this walk. Not that far out of Kelowna you have Myrna Canyon Bike Rental. 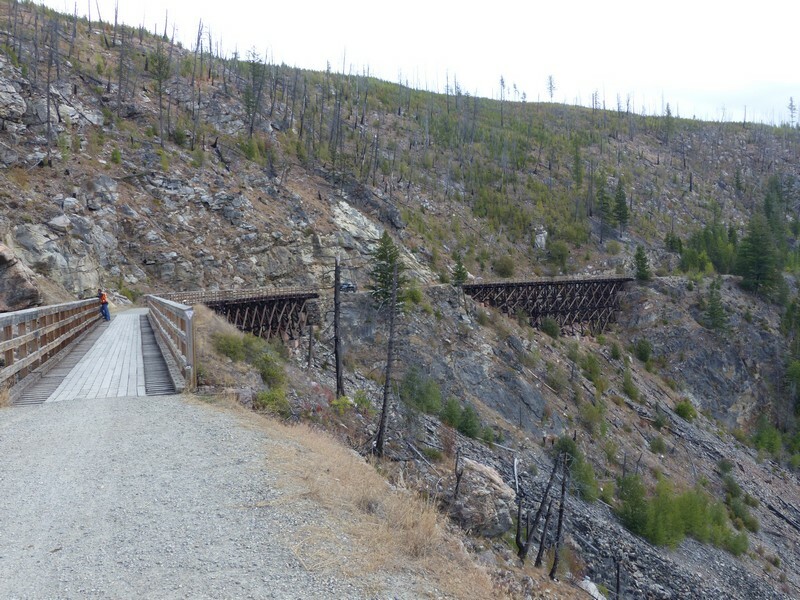 You can bike a 22.6 km return trail where you pass several old train trestles. It’s not that cheap but worth the money. The bike round trip took us 2 hours. The plan was to stay on a camping in Kelowna, but after checking that one out, we decided to skip it and continue our journey. We scanned AirBnb and found a spot which was only 1$ more expensive than a camping, located in Vernon. It was convenient to have our laundry done. The place had 2 AirBnb listings and we met that night a loverly couple from France. We had dinner, some drinks and went to bed. We did not explore Vernon any further. We continued on route 97A and along the road we stopped at The Enchanted Forest, which is a nice stop over if you have kids. It tells all kinds of fairy tails and has sculptures about them. It took us 1 to 2 hours to visit the entire park. Including the board walk with the salmon breeding place and the silent boat trip. Not the most thrilled place to visit, but it’s nicely done, and if you’re not in a rush, don’t hesitate to stop over. Around noon we arrived in Revelstoke. We first wanted to visit the Revelstoke Dam, but it has been closed down for visits. 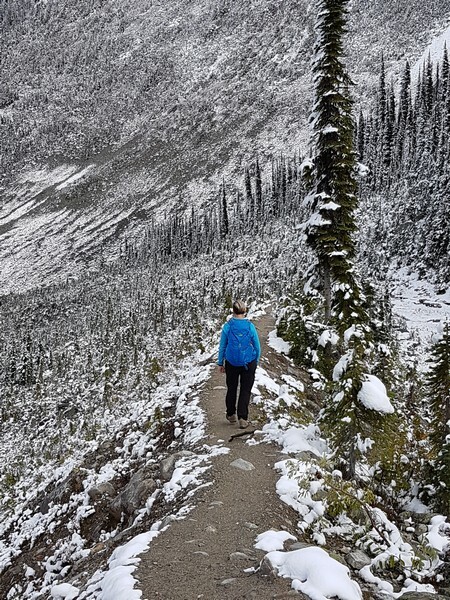 We then decided to visit Mount Revelstoke National Park. It’s known for it’s marvelous 360° views from on the top of Mt. Revelstoke. 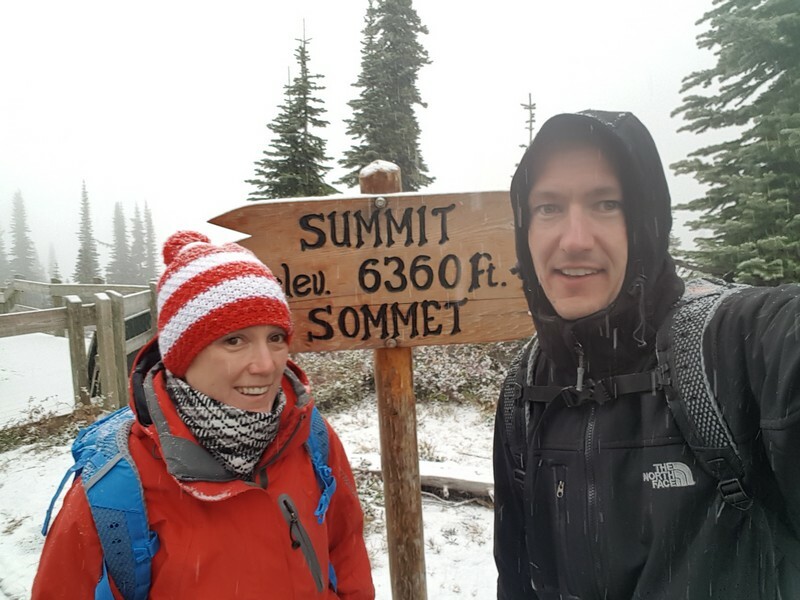 The weather was not optimal, and the lady at the entrance told us that it could snow on the top, but we took our chances. It takes about 30 minute to drive up the mountain. The further we mounted, the deeper the temperature dropped. We started at 18° and on the top it was around 2°. Just before the top we saw the first snow. You can’t reach the top by your car. The last 2 km you either do by foot or by shuttle. As the sky was grey and it was freezing cold we decided to take the shuttle. On the top we explored the area, but the weather was just too bad. A pity, but still, we decided to go down to our car in the snow. That took around 20 minutes. Along the descend you have several marked hiking trails. We did the Inspiration Woods walk (2.6 km for approximately 30 minutes) and we also stopped to walk to the Nels Nelsen Hill. It’s an abandoned ski jumping hill, where you can place yourself on a statue just before a skier lifts off, which is quite impressive and freighting. It’s worth to get out of your car and take a look. As we moved further on Highway 1 we also stopped and took the Skunk Cabbage Boardwalk walk. It only is 1.5 km, but in summer it must be nice. Now it started to rain here as well, so we didn’t spend too long here. The walk takes only 15 minutes and we moved on. As the day was coming to and end, we decided to start looking for a camping spot. We stayed on a camping ground in The Glacier National Park. Loop Brook Campground: A self-serviced camping ground with a shelter and fire wood ready if you buy a fire permit. We were alone close to the first shelter, so we had our private spot. It was rainy and cold, thus it was very welcome to make some fire. There were fixed toilets, but no showers. Luckily it stopped raining so we could set up our tent without too much hassle. In the morning we used once more the shelter to make some fire and warm ourselves before starting our day. A shelter really has an added value when the weather is average. Luckily no more rain after we set up our tent. We got up early and decided to take the Loop Brook Trestles trail which is a 2 km loop trail around the camping ground. As took a wrong path, it took us 2.5 km. The trail passes some special trestles which are worth the visit. The fact that people build this so the trains could pass this area is quite impressive. We moved forward and decided to make our first long hike of our trip. We decided to combine the Asulkan Valley and Great Glacier trails. In total this made around 18 km and good for 3 to 4 hours of hiking. It’s a pity that both walk are return walks, but still you experience it differently depending of your direction. With the Asulkan Valley walk it started off gently and after half an hour we started with the climb. The last 45 minutes we reached the snow. On the return we were heading back to our car when we saw a sign for another walk, the Great Glacier trail. We decided to follow it as it didn’t seem to hard. After 20 minutes we had to start going up very steep. We suffered quite a lot and we started to feel the previous kilometres. Luckily we had some bars with us, which we enjoyed together with a fresh drink. At some point you’ll reach some huge rocks and it seems the trail is a dead end. You have to stop here, don’t proceed. The rest of the trail is only accessible for trained people using special gear. After this walk we continued driving toward Banff. We lost a bit track of time and suddenly it was later than planned. Around 17:00 we started to fear that we would not reach Banff. However, we did not realise that we already cross to another timezone. Shifting 1 hour further. We decided to call it a day and to search for a camping in Golden. Golden municipal campground: Quite expensive campground where you have to pay extra for a 3 minute shower. There was a shelter but we did not use it. We could use the overhang of the friendly people next to us. We could also use their water kettle and they provided us with an extra blanket and freshly made peach pie. Friendly people those Canadien. 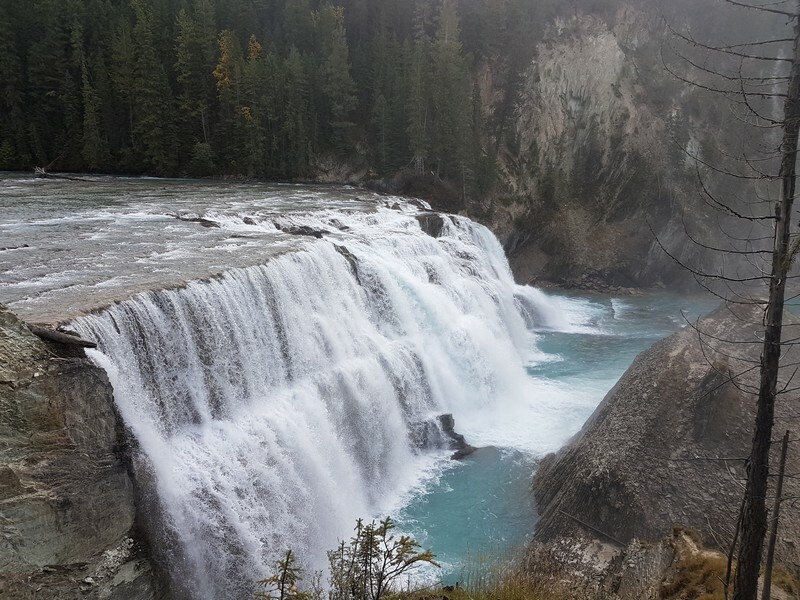 After our breakfast we hit the road and a first intermediate stop where the Wapta Falls. The return walk to the falls is around 4.5 km which took us 45 minutes. It was a nice fall, but as we have seen plenty of them on previous travels, we would not have done it if we would have know upfront. So if you are in a rush, I would skip this one. If you have plenty of time, you can take the extra hike. The parking lot is very close to the Natural Bridge and we spend here about 15 minutes before we decided to move forward. When you continue the same road, you will reach Emerald Lake. When we got close to the parking lot we realised we would not be alone. There were few hundred of visitors. However, once we reached the border of the like, it’s beauty was incredible. This was the first coloured lake of our journey and It was really magnificent! After our visit of Emerald Lake we proceeded and passed the exit of O’Hara Falls. If you didn’t reserve this visit a couple of months upfront, don’t bother of even thinking to visit it. To respect nature the number of people to visit are allowed. We continued in the direction of Banff. We took the time to visit in the Visitor Centre next to the road and that was wise to do so. Where in the previous times we had smaller campgrounds and were not thinking too much on where to sleep, here the places become more scarce. We learned here to go check – in on the campground early and then spend the rest of the day. This was exactly what we did. We praised ourselves very lucky when at the end of the day, we saw easily 20 cars queuing to register on the campground. After registration we decided to head out for Lake Louise. Something else learned at the tourist office is to visit Lake Louise either early in the morning or late in the evening. Otherwise the parking lots are full and you have to park at the overflow parking and take a shuttle up the mountain towards the lakes. 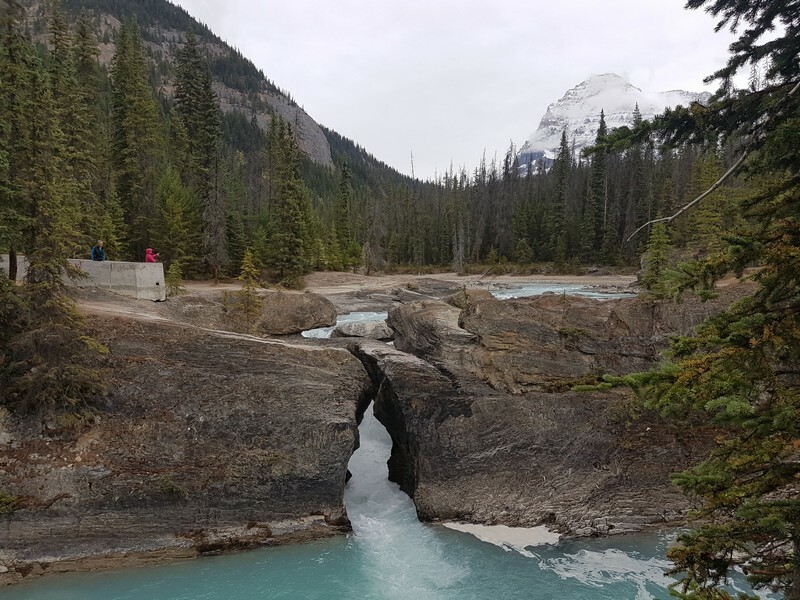 Lake Louise Campground: You can clearly see that you are in a very touristic area as the campground is surrounded with an electrical fence. Knowing that we slept a couple of days in the middle of nowhere, open to all nature creatures this kinda felt strange. We bought a fire permit and then you can take as much firewood as you like. It’s in an area, but not under a roof, so you have to search a bit for dry and decent wood. The camping spot is big enough and there are plenty of sanitary blocks, however only having toilets. For the showers you have to go to the main block at the side of the park. We are not scared of a walk, however, we took the car to go there after we came back from a very early Lake Louise visit. I don’t think there are plenty of alternatives close around Lake Louise. We were out of the season, and the tent camping ground was about to close 3 days after our visit. It was still quite busy. We strongly advise to reserve a spot if you go here in season. Today we planned a serious walk called the Iceline trail (Detailed blog). An approximately 20 km long trail with around 1.000 meters of altitude with magnificent views. As this is a loop (our preferred hikes) you can take it in both directions. We recommend to take it clockwise, then you start with a steep climb, but then you stay at that height for quite some time before slowly descending. But of course this is a personal choice. As it has snowed the days before, we found it also easier to climb on the snowed paths, rather than going down on the slippery parts. There are not everywhere signs, but we managed to follow the track by looking for tracks on the rocks. Only half way the track we saw another couple that was doing the trail in the opposite direction. For the rest we were completely alone for the whole day. It was an incredible walk with nice views, but you should not underestimate it. If you are not used to walk, approximately 24 km (including going wrong no the parking in the morning) is not trivial. Also make sure that you have clothes for all kinds of weather as it can easily change during the day. This night we slept again on the Lake Louise Campground. After a well deserved shower we headed to Banff. 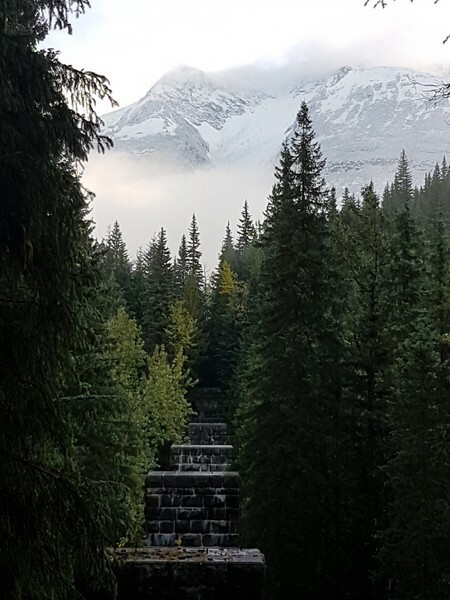 Below you see a picture from the road from Lake Louise area towards Banff. The views are again magnificent. Banff is a sociable city and we strolled a bit in the main street and stopped for coffee and cake in a cozy place called Evelyns Coffee Bar. The city has a great atmosphere and we would have loved staying longer, but we had still a 40 minute drive back to the camp ground and after such a long day, we decided to head back. 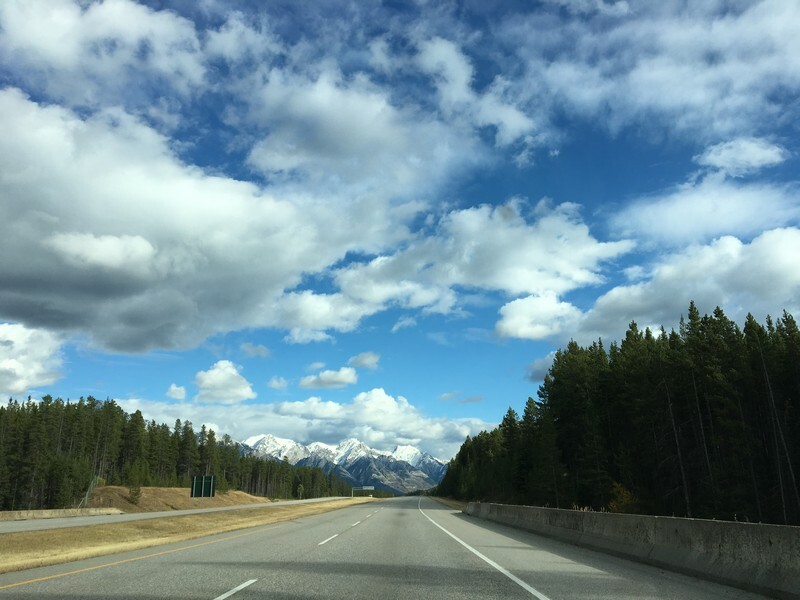 When you travel from Banff towards Jasper you do that via the Icefields Parkway, which is described as one of the most beautiful roads in the world with lots of magnificent sights. We probably did not stop at all of them, but we tried to pick the nicest ones. This lake is really next to the Icefields Parkway, so you can easily pull over, park and enjoy it. As we were there Mid-September, and still early, we were there alone with another couple. You can take some great pictures here. When you exit the Icefields Parkway you follow the road towards the parking lot. There are signs that you cannot go till the end. Only tour buses and disabled persons can continue. As we were very early and there was no single tour bus around, we decided to go till the parking lot. Convenient, but off course we cannot encourage you to do the same. The parking lot was almost empty and we hiked to the view point. As we had some snow earlier, there were still some left overs at that altitude. So be sure you have proper shoe ware when going there. The view was incredible and the color of the lake was magnificent. This canyon can be found after a short but steep and rocky hike. The power of the canyon is impressive. You can see it from different angles. There are clear traces of passing the fences to get a closer look. We did this as well. As long as you stay on a safe distance, we don’t think anything can go wrong. Off course we were there on a dry day. When it has rained or there are still snow left overs, please don’t go closer. Then it might get dangerous. This viewpoint is easily reachable from the parking lot just next to the highway and from the viewpoint you can see the North Saskatchewan River. There is a very small historical walk with information panes. However, we were not impressed, and if you don’t have too much time, it’s safe to skip this. When you approach the area coming from direction of Banff you will notice when you’re getting close. It’s got busy and suddenly we saw dozens of tour buses, even though we went off peak season. You can see the glacier from far and we went on the parking lot. For us it immediate felt too touristic and then you feel it will be costly. They offer tour with buses with huge tires to go on the glacier, but we don’t see the added value. On previous travels we were on a glacier and in the end they look the same. Don’t get me wrong. It’s still beautiful and worth a visit, but I doubt it’s worth the money you spent on it. We leave it up to you to decide what you want or prefer. But I would rather spend the money on another activity. However if you never saw or went on a glacier, you might decide otherwise. Great falls approximately 500 meters away from the highway. The falls are close to the parking lot. There are two parts, so make sure you visit them both. It was not crowded when we were there. About 20 minutes from the Sunwapta Falls you have the Athabasca Falls. Here you have to be prepared. It’s very busy and you might think you are in Asia. There are really lots of Asian tourists. Nevertheless you should visit this falls and with some patience you can still take the perfect picture. But here we wonder again, this was off peak season. How would this place look like in peak season? A must visit canyon according to us. You reach it on the road from Jasper towards Maligne Lake, and you can park close. Funny thing is that they sell everywhere Belgian waffles here. Tempting, but we resisted. Once you leave the parking lot it’s not far to the canyon and the first 4 bridges across the canyon are pretty close. It might be a challenge for people with height fear. When you are on a bridge across the canyon, you see the water several dozen of meters below. You can do a walk and visit more bridges, but we decided to only visit the first ones. We read incredible things about and that caught our attention. However, the lake is at the end of a 50 km one direction way. Which means you have to return the same 50 km. We were doubting to go there and conclusion is that we don’t recommend it. You have so many other lakes which are easier accessible. It’s also a very touristic place and it only get a little better when you move away from the parking lot and the boat house area. When we were there after a day of snow, so hiking around the lake was more difficult. We did a small hike and left after approximately 1 hour. Probably it’s just us, but where we loved Banff we just didn’t feel it with Jasper. Campings were far from the center and didn’t attract us. 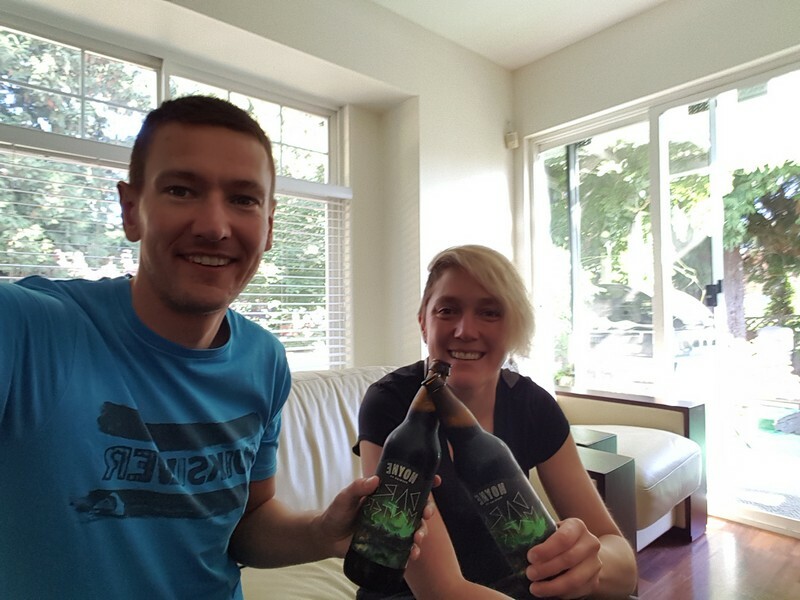 There were no AirBnb possibilities that suited us and the hotel prices were insane. The cheapest hotel was around 170 euro per night and then you still had a shared bathroom. Before we moved further we treated ourselves on some sweets and coffee in the famous The Other Paw Bakery. It’s a very busy place and it might take you some time to get your order, but it tasted well and the coffee was good. 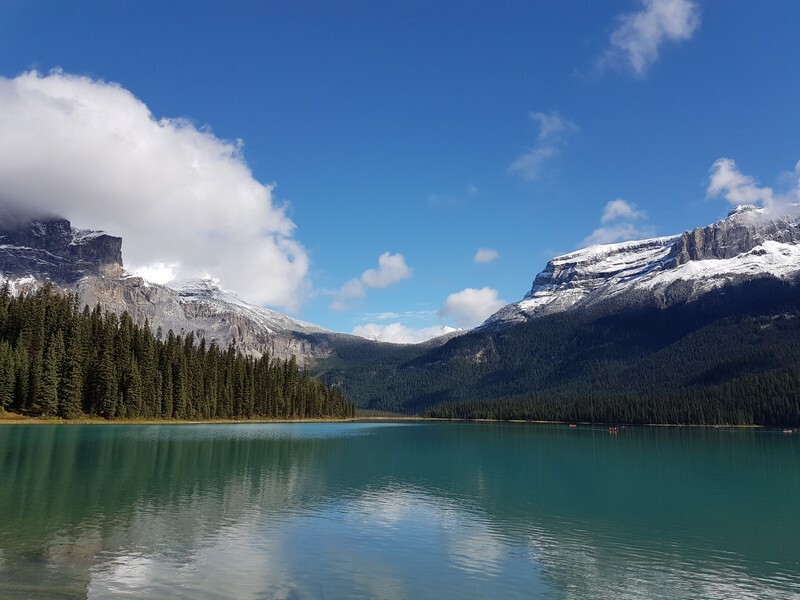 Yellowhead RV Park & Campground: While moving away from Jasper and the evening starting to fall, we decided to stay the night at this campground. This was a top camping. It starts with a friendly welcome and quick check in. We got a spot in the back, close to the river. It was giving the time of the year rather silent on the campground. The restrooms are one of the cleanest ever seen, awesome spotless showers. We can strongly recommend this place. While continuing our journey we thought of going to Mud Lake. We found the entrance and after some time you reach the recreation zone where you can book river and jeep safari. As we didn’t want to do that we decided to drive further with our own car. The road became worse and worse and at some point we realized this was no longer a good idea. We turned back and headed to the main road. Either it’s not advised to go their by normal car, or we took a wrong way. Maybe you have more luck when trying to find or visit it. Before going to the park we had some awesome cake and coffee in the small and cosy bakery across the visitor center, called Strawberry Moose Snackery. The place was so nice that we had some food when coming back from the park as well. There is a single road that leads you into Wells Gray Provincial Park and you will return via the same road. We learned from the friendly staff in the visitor center what there was to do and they were helpful. Considering there was chance to some light rain, they advised us to take a hike which is under high trees, so we could potentially keep it dry. That hike was deep in the park, and after some kilometers the asphalt road changed into a dirt road, but once we reached it, we had a nice walk. We advise to go first for this walk, and then make it back to the entrance by stopping at several waterfalls. Each waterfall is completely different and worth the visit. After a day in the Provincial Park, we headed further towards Kamloops. Although they did not predict any rain, the weather was still doubtful so we decided to not take our chances and decided to go for an AirBnb. We found a nicely priced one where they had a swimming pool and hot tub. Now, as we only booked the place at 18:00 there was not much time left to take benefit of these features. We had a drink, took dinner and had a nice chat with the hosts. As usual we went to bed quite early. From Kamloops till Whistler we had to take highway 99, which is maybe not as famous as Icefields Parkway, but is also very beautifull. As we had been in the car for quite a while we both felt the need to urgently take some fresh air. 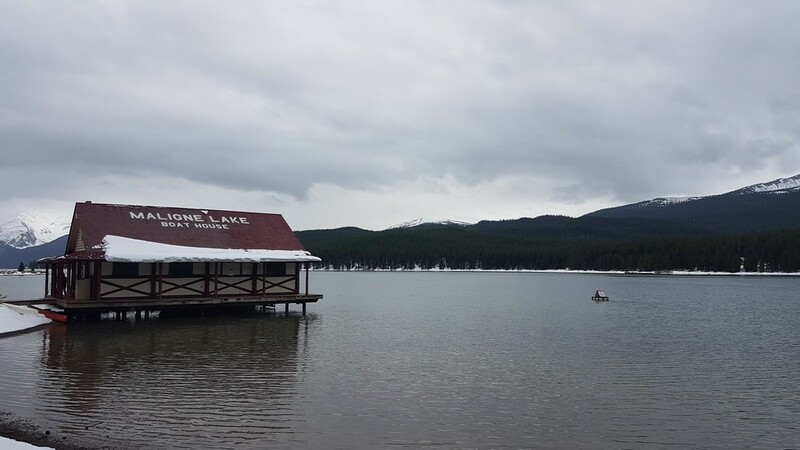 On our travel guide we saw Joffres Lake Provincial Park. Not too famous according to us, and if we would not have felt the need to get out of the car, we might have skipped it and go immediately to Whistler. Oh boy, what would that have been a mistake! 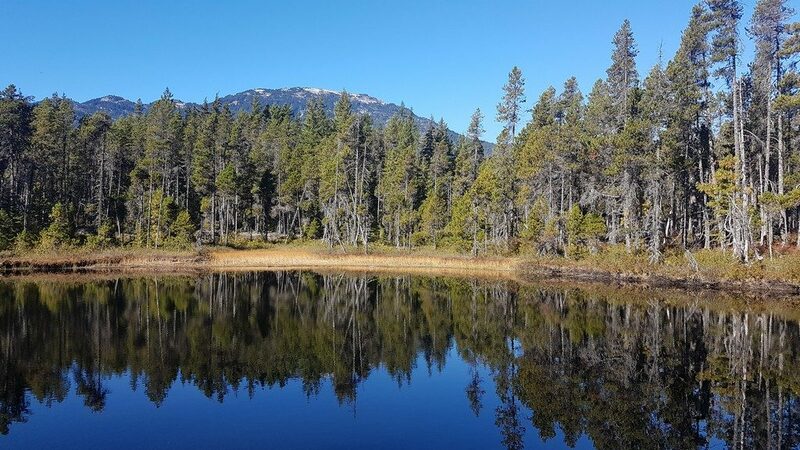 There are 3 lakes and hiking to the upper lake and back is stated to be a little over 3 hours. As most of the times this is overestimated for us and our effective walking time was about one hour and a half. From the parking lot you can easily reach the first lake of three. Three quarter of the people, certainly those coming by bus, only visit this lake. Although it’s marvelous as well, it would be a big mistake to not go up to the other lakes. It’s an intensive hike and there are steep parts, but after about 30 minutes you reach the second like. Once you go around the corner you will be hit by the gorgeous view of the second lake. Our absolute favorite of the three lakes. It’s hard to classify mother nature’s brilliance, and it even often depends on the weather or the season, but this was really incredible. 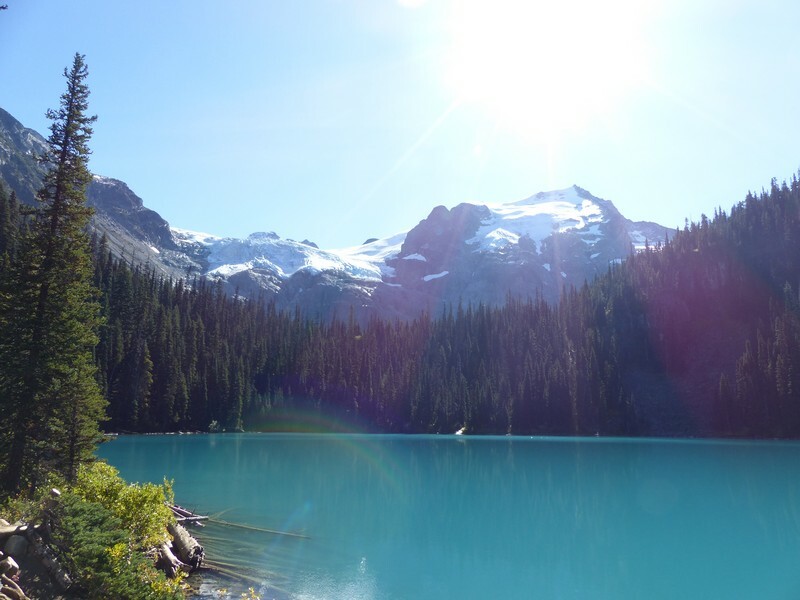 Perfect weather, turquoise water, snow, mountains. If you are in the area this is a must visit. It’s even worth a serious detour according to us. From there you can hike further up, passing a nice stair falls and reaching the third lake. After going down, we observed a little more the incredible view of the second lake and off course took some mandatory pictures of the old tree lying in the water. You find plenty of those on the internet. Two nice ladies took some pictures of us, and they also took some of us while walking on the tree in the water. We were doubting quite some time where to stay the night. Looking for a hotel or a camping. Issue was that there was only 1 camping close to the center which has sanitary blocks. It was very expensive to stay with a tent and even more annoying, it was a walk-in camping meaning you have to park outside the camping and carry everything to your rented space. Luckily they have some wheelbarrows available. We decided to take a spot near the back parking, so we were pretty close to our car and only 3 other cars were present there. Another annoying surprise was that the shower was with a surcharge with limited shower time. We also had in mind to do our laundry as the camping had quite some amenities, but at our time the laundry area was closed for renovation. Another bummer. Although the rest was clean and fine, the price and amenities made this one of the least camping experiences to us. In the morning we decided to go for a hike and visit the Brandywine falls. We started from the parking lot our way up to the bungee jump bridge. A return hike from approximately 7 km. You cross first a railway, then you can continue to the falls and while going up further you will pass a marvelous small lake which look completely black. The reflection of the tree in the water was beautiful. Just a little further you can cross the river via the bridge on which they do bungee jumps. Quite impressive and probably not nice for people with fear of heights. After crossing back, we had our small lunch on a bench next to the black lake. There should have been big frogs, but we didn’t spot any. While heading further to Vancouver we made a small planning mistake. As AirBnb is not allowed in the real center of Vancouver, but it is in some other parts we booked something in the area of Burnaby. Now, as we were thinking to take the boat in Horseshoe Bay, this was not the best choice. Coming from Whistler we had to cross entire Vancouver for our sleeping place, and the day after, we had to cross Vancouver again, back to Horseshoe Bay. From Horseshoe Bay we went to Nanaimo on Vancouver Island. From there we headed to Victoria, which was in combination with our selected ferry not an optimal choice as we had to drive the distance to Victoria and later on, as we planned to go to The Pacific Rim, drive all the way back. Taking the ferry from Vancouver to Victoria might probably have been a better choice. Now, if you plan your itinerary at the fly as we did, you have to accept that every now and then things are less optimal planned. It was a little more annoying as we lost 30 minutes in traffic jam to cross Vancouver as we ended up in rush hour. 30 minutes might not sound that much, but if you were out there in the middle of nowhere for over 2 weeks, the crowds feels extra annoying. You might want to take this into account when planning your own trip. As the day had come to an end, we decided to go for a restaurant in the area. As we wanted to go by foot, we went to The Keg Steakhouse not far from our AirBnb. It’s a chain with a huge crowd. Something typical for the States, but we were hungry, didn’t want to that far, so it had to do. We had a drink at the big bar while our table was being freed up and after we had an nice dinner. It was rather expensive comparing to European standards, but I remember I really enjoyed the food. The steak was cooked perfectly and the meat was tender. As it became dark till the time we were done, we requested a taxi to go back to our AirBnb. We got up quite early and headed back to Horseshoe Bay by crossing Vancouver. Luckily we didn’t had any traffic jam and with the ferry everything went very smooth as they are used to this in this area. Once arrived in Nanaimo we headed towards Victoria. Goldstream Provincial Park Campground: To reach this campground you have to go through a residential area, so you when you think you’re going wrong, just continue a bit further. Once you enter the parking, you are 100% in nature. You have several levels on the campground. First we settled in the lower area, but there was no sanitary block in the direct neighborhood. When looking on the map, we realized the campground was way bigger so we decided to relocate to a higher level, closer to the sanitary block. The camping places are big enough to put a tent and to park your car. You also have a fire pit. Firewood you can buy from the ranger when they come around to collect the fee for the camping. The sanitary blocks are OK. Certainly not the best we have seen, but still more than fine. Before heading to Victoria itself we started the day with the Goldstream Trestle Trail. This intensive and difficult trail leads you to an abandon trestle which has an elevation of 170 meters. People are strongly discouraged to not go on the trestle itself, an advise we followed. However, the were few youngster going onto the bridge, a dangerous action. From there we headed toward Victoria for a city walk. We started by visiting Chinatown with the famous Fan Tan Alley. Strolling further down town till we save the impressive British Columbia Legislature building. On the list to visit we also had the Craigdarroch Castle of which we thought it was withing walking distance, but it is NOT. By now you might know that we are not afraid to take an extra mile, but this was a hard walk, as we were not mentally ready for it. And even a bigger disaster, as Tom did not started his Strava! Can you believe this? This second night we also stayed on the Goldstream Provincial Park campground. As said before our route was not optimal, so we had to head back from Victoria towards Pacific Rim by passing one more time in Nainamo. 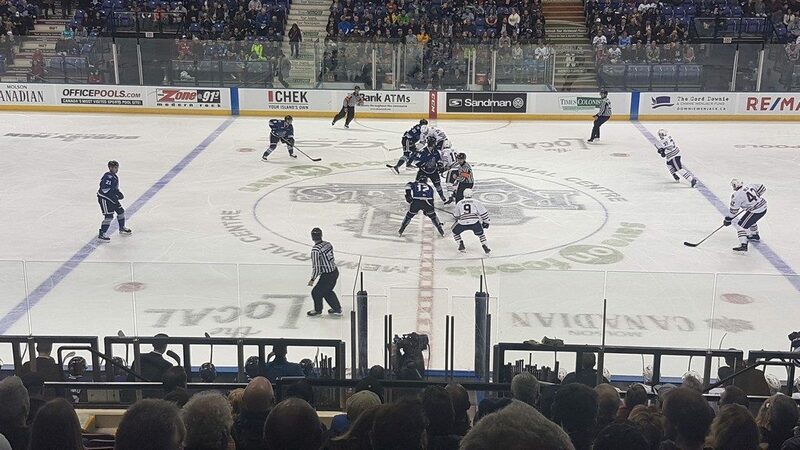 If you plan the same itinerary we advise that you take ferry from Vancouver to Victoria. Like this you avoid the double trip Nainamo – Victoria. We divided the 3 hours and a half drive in two by a stop over in Chemainus where you have some beautiful wall murals. There is a dedicated site which describes each of them. Please take the time to stroll around in this small village. While doing so, we had some great coffee and sweets in Willow Street Cafe. Furthermore you have some small shops, a theater and a waterwheel park. 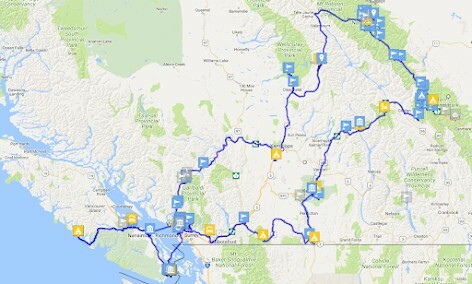 We did not visit any of those, we still had to drive quite a distance towards the Pacific Rim National park. Green Point Campground: This campground was centrally located between Tofino and Ucluelet. We read some negative things about the sanitary blocks upfront, but that must have been from before the renovation. We found brand new blocks which were well maintained, heated and nice hot showers. We can really advise this campground. It was also not very expensive for a night. I think around $21. It has straight access to the beach. You enter the park by passing the visitor center. We advise to stop there and do all internet related things before you continue. When you stay at the Green Point Campground like we did, you’ll be fully disconnected from the world. A real great experience in these busy days. So do your last bookings, reservations, … here if you need any. This park was a great way to finish our road trip in British Columbia and Alberta. Easy going, beautiful, friendly people and 2 small cities available for shopping. 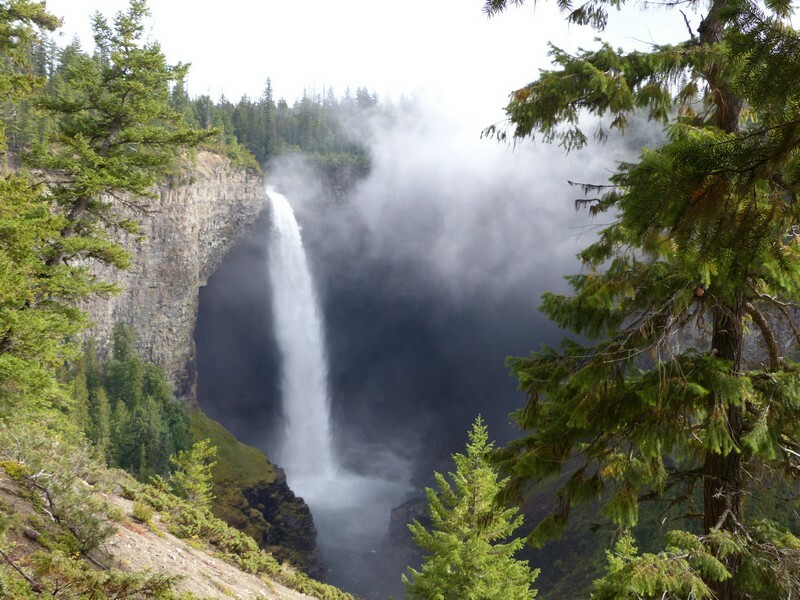 Next to that they have some smaller hikes, some near the coast, inside rain forests or the incredible Ancient Cedars Loop where you have trees where few are 12 m around their base. In Ucluelet we also did the lighthouse loop, but we found that one rather disappointing. There are better alternatives. 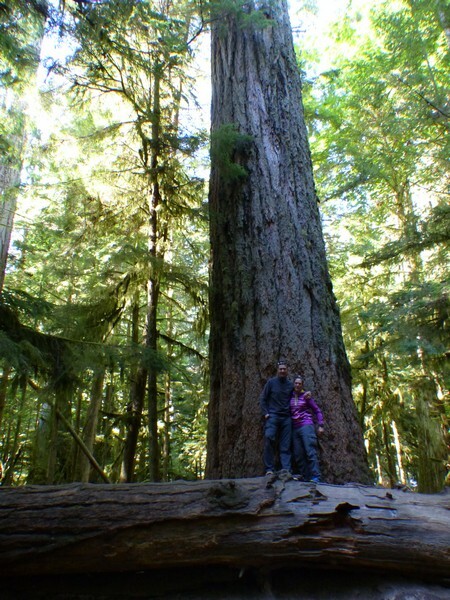 During our days in the Pacific Rim National Park we did several smaller trails: Nog trail, Ancient Cedars Loop, Lighthouse Loop, Rainforest trail, Schooner Cove, Tanquin trail. In Tofino we took the time to go to the beach and watch some surfers trying to beat the waves. Seems a sport for which you need a lot of patience, not sure if it would be something for us, although we often think we should give it a try. The advantage of not having planned anything during a trip is that you can adapt your itinerary according the moment. The Pacific Rim National Park was a far better experience than expected and we decided to stay a little longer here. The weather was terrific and we experienced 5 days in a row without a single cloud. I cannot recall ever have experienced this! This lead to great moments at the beach, nice nature walks and incredible sun sets. Today we leave Vancouver Island for what it is and head back to the main land. During this trip we had 2 stops foreseen, first was an impressive Douglas-fir tree which is over 800 years old, 76 m tall and 9 m around. This tree was over 300 years old when Christoper Columbus came to North America in 1492. It’s really incredible! You can walk the Cathedral Trail near Cameron Lake, between Port Alberni and Nanaimo. Second stop was the Old Country Market, in Coombs. An sich nothing special, but the owner decided some time ago to put some goats on the roof of his shop, which made it to a real tourist place. It’s not far around, so worth a quick stop. Aftere we headed further to Nanaimo where we took the ferry to Horseshoe bay. Today we it was finally time for our long planned meeting with the “Mother Nature’s Stairmaster”: Grouse Grind which is a 2.9 km trail up the face of Grouse Mountain. It has an elevation of 853 meters! An average person takes 1.5 to 2 hours to hike up the trail. We did it in approximately 1 hour, despite a common cold (seeking excuses?). See the statistics on Strava. You are not allowed to go back by foot. You have to take the cable lift which costs you $10. While heading back we passed the Capilano Suspension Bridge where mainly Tom had big expectations, as bridges are his thing :). Once we parked we realized this a typical tourist trap. Lots of buses, big crowds and crazy prices. As that is not our thing we decided too leave it for what it was. We already experienced hug suspension bridges during our Nepal trip anyway. But if this is your thing, go ahead and check it out. Heading back we did with a taxi, which is not always easy in Vancouver. Order your taxi well in time as it might take a longer time for them to arrive and often the don’t show up. Trip price from city center to our location was not cheap, but at that time you don’t have many other options. After our breakfast it was time to wrap up, pack our bags and head towards the airport. We dropped our car back at Hertz, which only took us 5 minutes. They have things arranged properly over there. Drop the bags and went for a lunch in a nice restaurant in the terminal where it was quiet to sit. We had our flight back at 15:40 and landed in Amsterdam the day after at 10:00.